Wow. Another year has gone by. While channeling a message for our Heart-Centered Support Group I received a message that this year is all about uncovering our ‘Gifts’. As we contemplate who we are and become more authentic we get to step into our truth and we begin to see who we truly are from a perspective of BEing instead of what we Do. And what does that mean for us? It means that we are in an authentic state of BEing which is who we are – and this is our ‘gift’ to the world. So it seems that this year – as it probably should be every year – the theme will be uncovering our ‘true gift’ and we may have many opportunities to rediscover this truth. Often we learn through challenges so remembering our ‘gift’ will make this an exciting journey and the challenges will not seem as difficult – as long as we are open to seeing. We may have many opportunities to see how we feel when we aren’t BEing our authentic selves but as we remember and share our authenticity with the world we will BEcome more aligned and will feel excited to share our ‘gift’ with the world. Where we may experience challenges this year will be around the parts of ourselves where we aren’t being authentic. This year, since the goal will be to BEcome our authentic selves and share our ‘gift’ of ourselves to the world, we will have opportunities to see where we aren’t BEing ourselves. These will be the areas where we are holding onto suffering. Our natural state and gift will never be to suffer. Suffering is a ‘human’ quality and is caused when we are holding onto something that is no longer healthy such as when we hold onto feelings about past relationships or we hold onto emotions within our current relationships. An example of holding onto emotions might be when we hold onto anger which is usually attached to a person or to an event connected to a person. As I have said many times: anger isn’t a primary emotion. So when we hold onto anger we have another emotion being completely suppressed. And any negative and suppressed emotion that we hold onto suggests that we haven’t forgiven that person. To ‘let go’ we have to forgive! We not only have to forgive the other person but we have to forgive ourselves. When we suffer – because we are holding onto unexpressed emotions – we can’t move on to healthier relationships either. So I believe that we will be learning ‘forgiveness’ this year as this is the only way to truly let go and move into our authentic state to express our ‘gift’! To fast track this I suggest that you make a list of the areas in your life or the people in your life where you aren’t BEing authentic, where you are feeling the challenges, where you feel that you are suffering. Think of the people you feel stuck with: people at work, family or friends – people who you just can’t seem to forgive. These people will be highlighted for you this year so that you can move into your more authentic self. This process doesn’t have to be difficult – as long as you can forgive. There are a number of ways to forgive people: putting yourself in their shoes, having compassion for them, or thinking of ways to be grateful for them. Think about the people on your list and apply any of these ideas on forgiveness. See how it works for you. And it is okay to remember that often we hold onto different grudges because there is a deeper core issue being triggered. For me I have figured out that my biggest trigger is around not feeling supported. The people in my life who have triggered this the most are my family and I find it most difficult to forgive them. However, because not feeling supported is a very deep trigger for me it is not always apparent when I get triggered by that feeling. Once I can see that whatever it is that has ‘triggered’ the feelings in me is around ‘support’, I am able to consciously acknowledge my ego and my wounded inner child. Then I can offer the support to my ego and to my inner child that I have never felt from my family. And I can also acknowledge the support I have in other areas of my life so that I can ‘discuss’ with my ego that my belief isn’t true that ‘I’m never supported’. Eventually, once we have truly forgiven from our gut – where our need is to feel safe – and from our heart – where our need is to trust – we will no longer be triggered the same way. For me it is an ongoing process! Since this is a theme throughout the year I invite you to contemplate the ‘gift of yourself’ – the ‘gift’ of you without suffering, the ‘gift’ of you as a person who has forgiven others so that you can be authentic. As we move into the New Year how you would like to BE and what is your authentic ‘gift’ to the world? Once you remember who you are then practice BEing this from within yourself. Any time that you are taken out of this practice in BEing there will be something to contemplate. What triggered you to take you out of your authentic state? Who triggered you and what events lead up to you being taken out of authenticity? And as part of your ‘practice’ in BEing take time each morning this year to connect with the Divine Spark within your heart, grounding it in the Heart of the Planet and then connecting it upward to the Heart of Source. This will create a space where you can get centered and where you can set your intentions for the day. It is also a space where you can contemplate your authentic self – and give forgiveness to those for whom forgiveness is required … for your own authenticity and ‘gifts’ to shine. 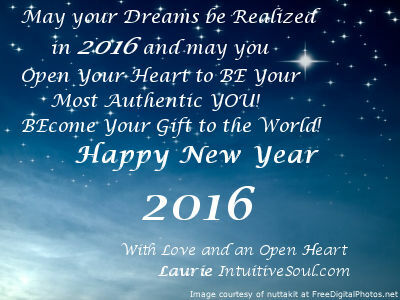 May your Dreams be realized in 2016 and may you have the Awareness to nurture this highest vision within! Happy New Year! This entry was posted in Blog and tagged Clearing and Healing Techniques, clearing energy, Discovering our Gifts, Forgiveness, Happy New Year 2016, Intuitive Counseling, intuitive counselor, Intuitive Soul, Laurie Huston, Setting Intentions for New Years. Bookmark the permalink.